It's been a lot of work renovating all the rooms of our "empty nest" home, but it's been fun and very rewarding. We are finally done with the Master Bedroom! 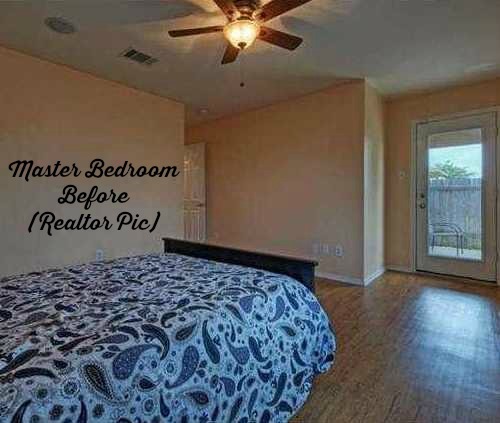 One of the things that really sold me on this house was the size of the master bedroom. Of course, rooms always look bigger when there is only one piece of furniture in them. There were many things I wanted to change about the master bedroom. The flooring that looks beautiful in the realtor photos is actually a cheap vinyl tile. The peach paint on the wall is the same color I painted over in my Blogging Office makeover because I didn't like it. I painted the walls with Behr Gobi Desert, the same color I used in our Master Bathroom makeover, to tie the rooms together. I also purchased a stained glass film to cover the door window, so the light would come in, but obstruct the view into the room from the outside. We had the floors removed and beautiful new carpeting put down in the master bedroom, plus we put new carpeting in my blogging office room and the guest room (so this was a mostly DIY project). The closets in each of the three rooms also got new carpeting. I am SO happy to be rid of the vinyl floor tile and especially the nasty carpeting from the previous owners. We also replaced the ceiling fan and curtains. We hired Empire Today to do the floors. At our initial appointment, the salesman told us they would remove the old baseboards and we had the option to include the installation of new baseboards as long as we bought them and had them painted and ready to install, which we decided to do. We bought and painted a taller, flatter baseboard for a cleaner look. Unfortunately, the local Empire Today scheduling office failed to order the baseboard installation, so what should have been done the same day as the carpet installation, was completed two days later. It was quite inconvenient to us, as our new furniture arrived before the baseboards went in, but I'm very happy with the final outcome. I'm most excited about my new furniture. This set is my first-ever brand new master bedroom furniture set. Having all matching furniture pieces makes me feel like I'm in a fancy hotel. We purchased a queen bed, two nightstands, a tall chest, and a wide dresser from Rooms To Go. The salesman was fabulous, as was the delivery team. I highly recommend Rooms To Go! One of the nightstands has a thumb-print sized dent in it, but Rooms To Go has already scheduled a replacement piece to arrive. In the meantime, we can use the one we have until they bring the new one. We still have to unpack our decor and hang a few more wall hangings, but I'm delighted with my new master bedroom! The new carpeting feels so squishy soft under my feet and I simply love it. I prefer carpeting in bedrooms to hard floors because it's like a hug for my feet when I wake up in the morning. The master closet has the new carpeting and baseboards, but we do have a master closet makeover planned for the future, since we currently have just one shelf and one clothing rod. 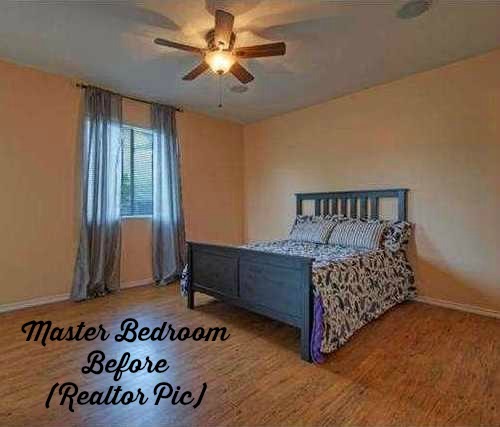 What do you think of my master bedroom makeover? You can check out my other renovations HERE. Lisa, this looks so good. What an improvement. Love your colors and your furniture, gives a very warm feeling! It looks beautiful. I have a love for darker wood too. Wonderful job! I love following your before-and-after posts. The room looks lovely! I really like the clean look of the room and dark colored furniture. We have been transitioning to darker wood furniture slowly for the past several years.... I really love the look! I think it looks great and quite comfy. Thank you! It is very comfy! I'm loving it! This is just beautiful. I love your clor choices, furniture, carpeting too.